After a flood damages the looms at Zenus Dane s Philadelphia textile mill and the bank demands loan payment, Zenus turns to his aunt for help repurposing his textiles. Trouble is . . . his aunt has already been hired by the lovely yet secretive Englishwoman Mary Varrs. Eager to acquire his aunt s quilt patterns, Zenus attends the summer Quilting Bee, a social event his aunt has uniquely designed with the secret purpose of finding Zenus a wife. However Zenus only has eyes for Mary, but Mary has no such desire for him. 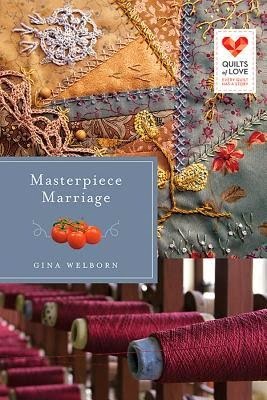 Though his aunt is determined to design a masterpiece marriage, both Zenus and Mary will have to overcome their stubborn ways. Can he realize that love requires stepping out of his routine? And will she recognize that following her heart doesn t mean sacrificing her ambition?" As much as I've loved the Quilts of Love series, I had a tough time getting into this one. I just couldn't seem to relate to the characters and it took me about half the book before I was truly engaged in the story. I'm not sure that it helped that the main male character's name was Zenus and I kept reading it as Zeus. That one is all on me though! Overall, not a bad read but it's just not going to make my top ten list for the year.